The modern machine park allows the following materials to be machined: aluminum, steel, stainless steel, copper, brass. We approach each order individually and offer professional implementation in every stage. 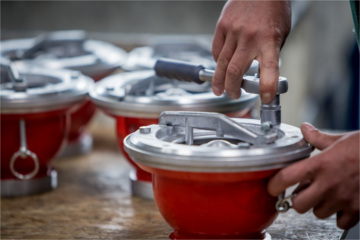 Supon specializes in complex manufacturing, starting with project, through foundry castings, precise machining and product assembly We accept orders for single stages of production. Customer can deliver raw materials, or use help of our’s purchase department. 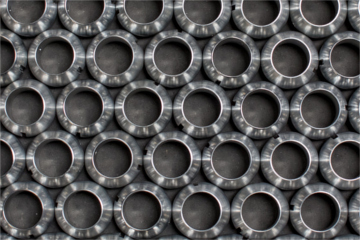 Wide range of products and comprehensive production capabilities determine our cooperation with many industries. We work on digital and conventional machines. Numerical control ensures the highest quality, time saving and repeatability of the components. Conventional is used for prototyping, atypical designs and small quantities. 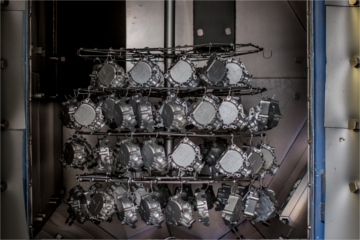 The metal block is scanned by the probe before machining. The geometry data provided in this way is necessary programming the machine. In order to verify the correct execution of the task, the probe renders the measurements. We realize typical orders as well as requiring special attention to detail. 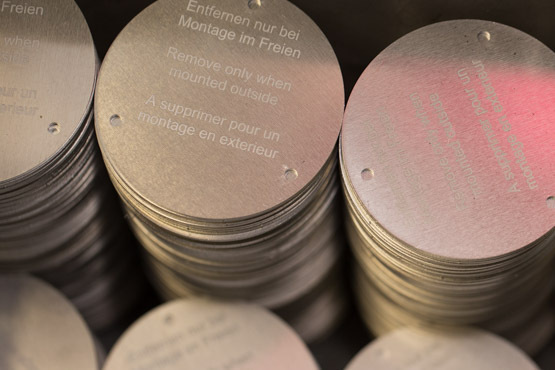 Our metal forming capabilities are practically unlimited. Research and construction department is at your disposal at the stage of project creation. 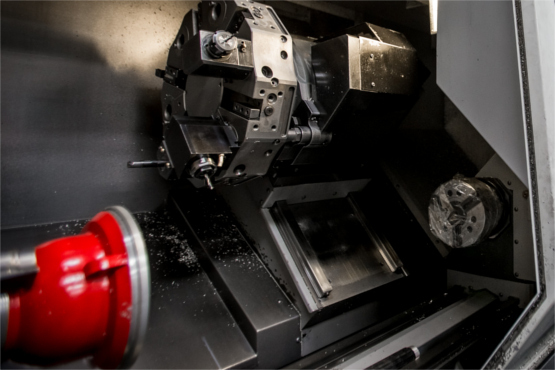 Three-axis and five-axis machining centers are controlled using professional CAD / CAM software. 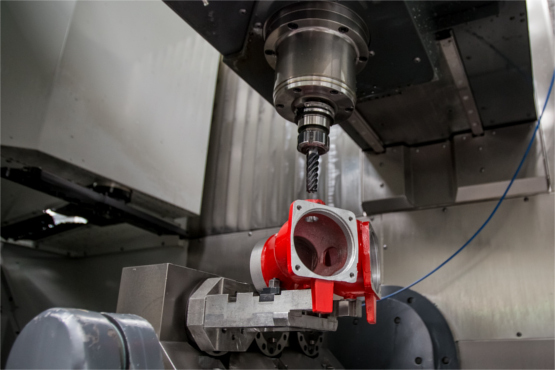 Cutting tools move in the X Y and Z axis axes to move closer to the workpiece from any direction. The table rotates in axes A and B, eliminating the need to manually rotate the milled element. 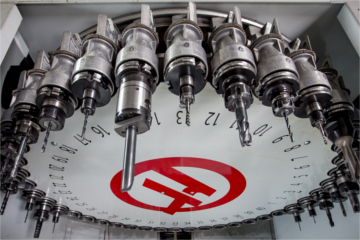 Lathes are equipped with Y-axis, vector drive, and hybrid heads. We roll internally and externally the elements of the shape of rotational bodies. Mass production is assisted by bar feeders. 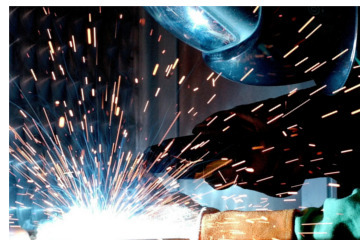 We offer comprehensive welding services by GMAW and TIG. 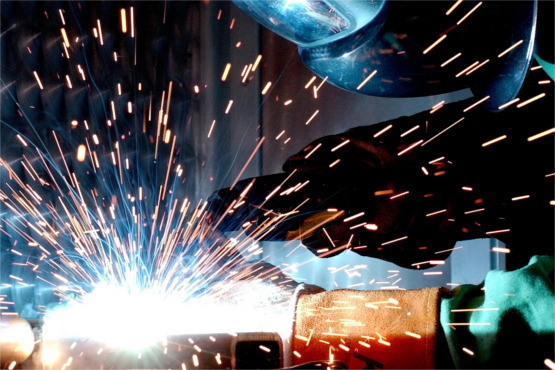 Modern equipment is designed forfast, accurate welding of aluminum, copper, brass, steel and stainless steel. 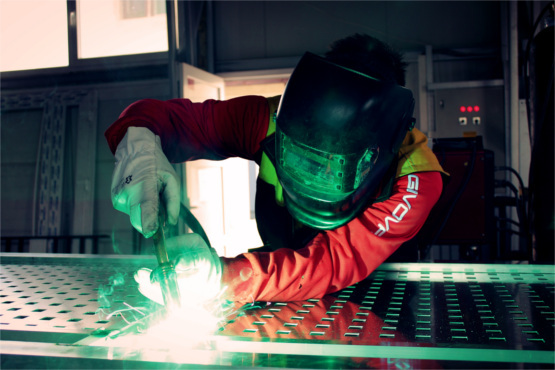 Gas metal arc welding (GMAW), refers to metal inert gas (MIG) welding and metal active gas (MAG) welding. In this welding process an electric arc forms between a consumable wireelectrode and the workpiece metals, causing them to melt and join. Gas tungsten arc welding (GTAW), also known as tungsten inert gas (TIG) welding, is an arc welding process that uses a non-consumable tungsten electrode to produce the weld. The weld area and electrode is protected from oxidation or other atmospheric contamination. A constant-current welding power supply produces electrical energy, which is conducted across the arc through a column of highly ionized gas and metal vapors known as a plasma. Shot blasting machines are used where parts or whole elements have to be derusted, descaled, deburred, desanded or cleaned in some form. Additional advantage is smoothing and strengthening of the surface. Elements are placed on the tape or suspended in the working chamber. The strand of the shot striking the parts and causes the surface impurities to be separated. The quality and roughness of the surface is dependent on the purge cycle duration and shot firing energy. Both parameters are fully adjustable from the control panel. Double hydraulic press equipped with hydraulic drive and electric control is designed for vulcanization of rubber products. The performance of the press depends on the technology of the vulcanized product. 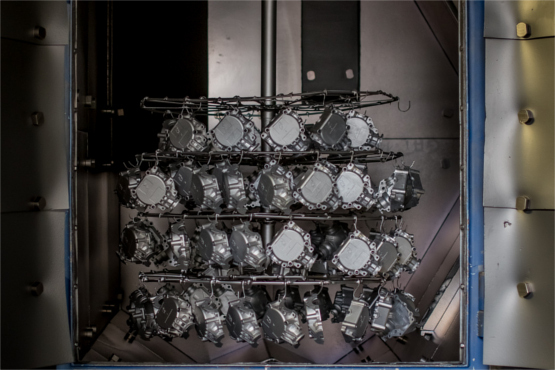 The vulcanisation process can be done in manual or automatic mode. Galvanising is the process of applying a protective zinc coating to steel, iron, copper or brass to prevent rusting. 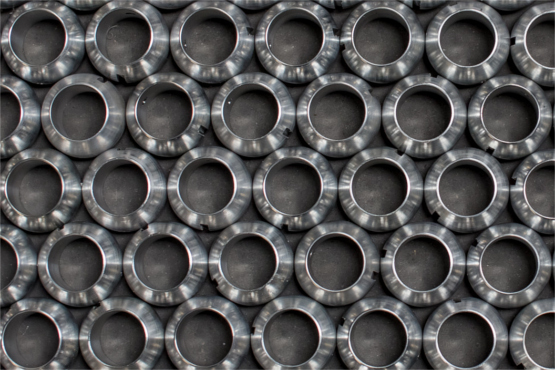 Anodising is an electrolytic passivation process used to increase the thickness of the natural oxide layer on the surface of aluminium parts. 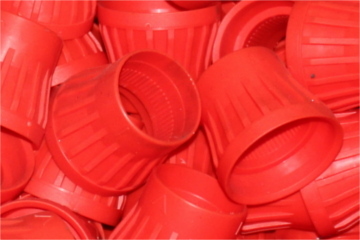 Thermoplastic injection molding consists of to creating parts by injecting a thermoplastic in the shape of already crafted mold. Manufactered this way parts have complex contours, exact dimensions and combinations. The height of the mold should be in the range 160-500 mm. We make custom thermoplastic details. 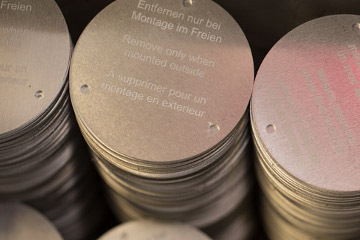 Laser marks in a precise and durable manner items of materials such as: metal, rubber, silicone, polypropylene, PVC, leather, paper, wood and ceramics. 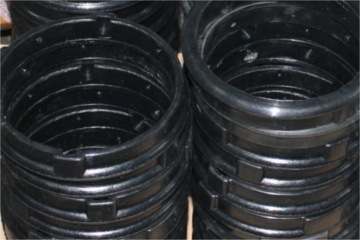 We assemble finished products in accordance with the technical documentation and customer instructions. We pack and organize shipping.